This distance feels good to me right now. At no point on the loop am I that far from home. It’s hilly. Hills keep me honest. No traffic lights to deal with, and no major intersections at all. It’s not perfect – it could stand some more shade, like most of Albuquerque – but it serves me well. On Wednesday, my plan was to run that loop after work. Well. After work, my motivation hung somewhere between gutter and curb-level. I needed inspiration, fast, so I did what many runners have probably done this week: I pulled up the videos of the women’s 1500m final and women’s steeplechase final from the recent Track & Field World Championships. Now that was some running! I finished one loop, and I knew I was done running for the day. I wasn’t ready to completely throw in the towel, though, so I branched off from the loop and walked for a bit. This continued for a couple of blocks. Then I asked myself what exactly I was doing. Was I trying to prove something to myself? Would anything terrible happen by cutting this workout short? If I wasn’t feeling that day’s run, couldn’t it be that perhaps my body was trying to talk to me, and perhaps I should practice what I preach all. the. time. and actually listen to it? Tired of all the questions, and tired in general, I turned around and walked home. When I was half a block away, I saw Robin Hood step out of our garage. Knowing that normally I would be running up our cul-de-sac, not walking, he came towards me, and as soon as we were within arms’ reach, gave me a big hug. We went inside. I drank some electrolytes. I took a shower. I reminded myself of one of running’s most beautiful truths, shamelessly stolen by Scarlett O’Hara: Tomorrow is another day. 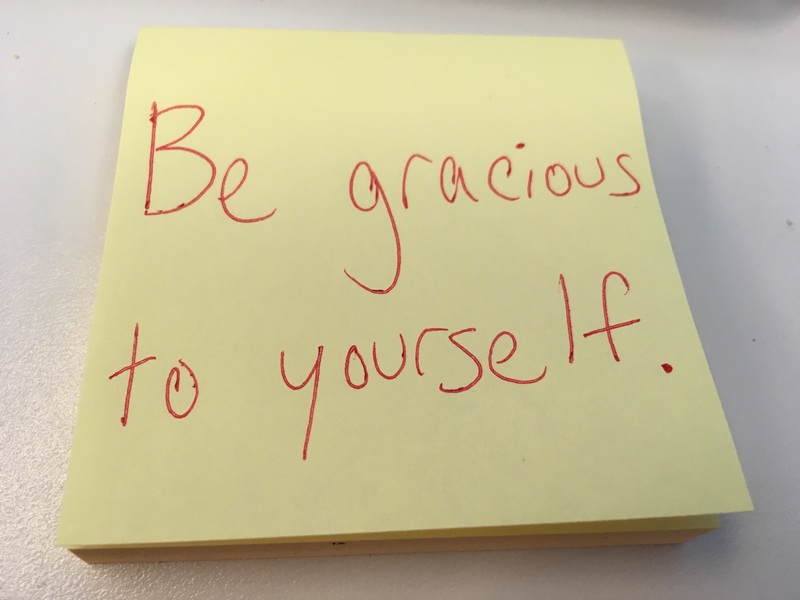 I gave myself a little grace. I recommend that to all of you. Just found your blog and I love your content! I’m a runner too so it’s always fun to hear other people’s stories. That is so important to remember and remind ourselves of! Happy Easter!! Little miracles are all around us 🌻. 💖💖💖 Pegasus forever and ever. Cold, calm distrust for the Easter Bunny. Similar to Santa, but with the bunny there was a definite sizing up and judgment. 2 Corinthians 12:9. Needed to see this today! First 5k of the year tomorrow!